*Click on the numbered dot to read the account from the Gospels. Jesus is born in Bethlehem as prophesied (Matthew 1:18-2:1). His birth is heralded by angels, and he is visited by shepherds (Luke 2:1-20). Joseph and Mary present him at the temple in Jerusalem according to Jewish law (Luke 2:21-40). Within the first two years of his life he is visited by Magi from the East (Matthew 2:1-12). Joseph, Mary, and Jesus return to Nazareth (Matthew 2:19-23). Jesus grows up in Nazareth, visiting Jerusalem each year for the Passover (Luke 2:40-52). John the Baptist begins his ministry of preparing people for the coming of the Messiah (Matthew 3:1-12; Mark 1:1-8; Luke 3:1-18; John 1:19-28). John baptizes Jesus in the Jordan River (Matthew 3:13-17; Mark 1:9-11; Luke 3:21-22; John 1:29-34). Jesus is tempted by the devil for 40 days in the wilderness (Matthew 4:1-11; Mark 1:12-13; Luke 4:1-13). Jesus first meets Andrew and Simon Peter (John 1:35-42). Jesus calls Philip and Nathanael as followers (John 1:43-51). Jesus attends a wedding where he turns water into wine (John 2:1-11). Jesus travels to Jerusalem for the Passover and clears the temple for the first time (John 2:13-25). Nicodemus visits Jesus at night. Jesus teaches him about the kingdom of God (John 3:1-21). Jesus and his disciples spend time baptizing in the Judean countryside (John 3:22). At Aenon near Salim, John the Baptist baptizes and continues to point to Jesus as the Messiah (John 3:23-36). Jesus speaks with a Samaritan woman at a well (John 4:1-42). Jesus returns to Galilee (John 4:43-45). Jesus heals a royal official’s son (John 4:46-54). Some time later, Jesus goes to Jerusalem for a Jewish festival. He heals a man near a pool (John 5:1-9). Jewish leaders confront Jesus about healing on the Sabbath. He teaches them about his authority and the Scriptures that testify about him (John 5:31-47). Jesus returns to Nazareth and preaches in the synagogue, but is rejected by the people in his hometown (Luke 4:14-30). Jesus goes to Capernaum and makes it his headquarters for ministry in Galilee (Matthew 4:12-17; Mark 1:14-15; Luke 4:31-32). Along the Sea of Galilee, Jesus calls Simon Peter, Andrew, James, and John as his disciples (Matthew 4:18-22; Mark 1:16-20; Luke 5:1-11). In Capernaum, Jesus drives out an impure spirit from a man (Mark 1:21-28; Luke 4:33-37). Jesus also heals Peter’s mother-in-law as well as many others (Luke 4:38-44). Jesus travels throughout the towns and villages of Galilee to preach and teach about the kingdom of God (Matthew 4:23-25; Mark 1:35-39; Luke 4:42-44). In one of the towns, Jesus heals a man with leprosy (Matthew 8:2-4; Mark 1:40-45; Luke 5:12-16). Jesus returns to Capernaum and forgives and heals a paralyzed man who is lowered through the roof (Matthew 9:1-8; Mark 2:1-12; Luke 5:17-26). Along the Sea of Galilee, Jesus calls the tax collector, Matthew, into discipleship (Matthew 9:9; Mark 2:13-14; Luke 5:27-28). While having dinner at Matthew’s house, Jesus teaches the Pharisees about God’s mercy (Matthew 9:10-13; Mark 2:15-17; Luke 5:29-32). Jesus is questioned about fasting and teaches about the new covenant with a parable (Matthew 9:14-17; Mark 2:18-22; Luke 5:33-39). On two separate Sabbaths, Jesus defends himself as Lord of the Sabbath (Matthew 12:1-14; Mark 2:23-3:6; Luke 6:1-11). Jesus goes up a mountainside with his disciples and chooses twelve of them to be his apostles (Mark 3:13-19; Luke 6:12-16). Finding a level place along the mountainside, Jesus delivers his famous Sermon on the Mount to the crowds (Matthew 5:1-7:29; Luke 6:17-49). Once again Jesus returns to Capernaum, where he heals a centurion’s servant (Matthew 8:5-13; Luke 7:1-10). Jesus travels to a town called Nain, where he raises a widow’s son back to life (Luke 7:11-17). It was perhaps in or around Nain where John the Baptist’s disciples come to him with a question about who he is (Matthew 11:2-19; Luke 7:18-35). Jesus also denounces the towns that failed to repent even after seeing his miracles (Matthew 11:20-30). Jesus is invited to dinner at a Pharisee’s house, where he is anointed with oil by a sinful woman (Luke 7:36-50). Jesus once again travels and preaches throughout Galilee (Luke 8:1-3). During this tour of preaching and teaching, Jesus is accused of being demon-possessed, confronted by his family, and a miraculous sign is demanded of him (Matthew 12:22-50; Mark 3:20-35; Luke 8:19-21). He also teaches the people using many parables (Matthew 13:1-53; Mark 4:1-34; Luke 8:4-18). While crossing the Sea of Galilee, Jesus calms a storm that threatened to drown him and his disciples (Matthew 8:18,23-27; Mark 4:35-41; Luke 8:22-25). In the area of the Gerasenes (or Gadarenes), Jesus restores a demon-possessed man by casting out the demons into a herd of pigs (Matthew 8:28-34; Mark 5:1-20; Luke 8:26-39). Most likely going back to Capernaum, Jesus is met by a large crowd. He heals a woman subject to bleeding for 12 years and then raises a synagogue leader’s daughter back to life (Matthew 9:18-26; Mark 5:21-43; Luke 8:40-56). Jesus heals two blind men and then casts a demon out of a mute man (Matthew 9:27-34). Jesus goes to his hometown of Nazareth and is rejected once again (Matthew 13:54-58; Mark 6:1-6). Jesus conducts a third preaching tour throughout Galilee. He also sends out his Twelve Disciples two-by-two to preach the gospel, giving them power to heal diseases and drive out demons (Matthew 9:35-11:1; Mark 6:6-13; Luke 9:1-6). It is during this time that John the Baptist is beheaded by King Herod (Matthew 14:1-12; Mark 6:14-29; Luke 9:7-9). After his disciples return, Jesus takes them across the Sea of Galilee to Bethsaida. He and his disciples try to withdraw to a solitary place for rest, but the crowds follow them. When it gets late, Jesus has compassion on them and miraculously feeds them all using five loaves of bread and two fish. The number of people who eat are 5,000 men, besides women and children (Matthew 14:13-21; Mark 6:30-44; Luke 9:10-17; John 6:1-13). Jesus sends his disciples on ahead of him while he goes up on a mountainside to pray during the night. They get in a boat and start traveling across the lake (Matthew 14:22-23; Mark 6:45-46; John 6:14-15). While his disciples were straining against the rough waters, Jesus meets them in the middle of the lake by walking on the water (Matthew 14:24-33; Mark 6:47-52; John 6:16-21). Jesus and his disciples land in Gennesaret and he heals many people (Matthew 14:34-36; Mark 6:53-56). The people find Jesus in Capernaum. He teaches them about faith and that he is the Bread of Life. Many of his followers abandon him (John 6:22-71). Possibly in Capernaum, Jesus confronts the Pharisees about their anti-scriptural traditions (Matthew 15:1-20; Mark 7:1-23; John 7:1). Jesus travels outside of Israel to the region of Tyre, where he heals the little daughter of a Syrophoenician woman (Matthew 15:21-28; Mark 7:24-30). Jesus travels through Sidon, down to the Sea of Galilee, and eventually to the Decapolis. In this region he heals many, including a man who is deaf and mute. He also miraculously feeds the crowd, which includes 4,000 men, besides women and children (Matthew 15:29-15:38; Mark 7:31-8:9). After crossing the lake, Jesus comes to Magadan (or Dalmanutha) where he rebukes Pharisees who demand a miraculous sign (Matthew 15:39-16:4; Mark 8:10-12). As Jesus and his disciples cross the lake once again, he warns them of the “yeast” of the Pharisees and Sadducees (Matthew 16:5-12; Mark 8:13-21). Upon reaching Bethsaida, Jesus heals a blind man (Mark 8:22-26). Jesus and his disciples travel to Caesarea Philippi. Peter confesses that Jesus is the Christ, and Jesus promises that the gates of Hades will not overcome Christ’s Church. Jesus also gives the “keys to the kingdom of heaven” (Matthew 16:13-20; Mark 8:27-30; Luke 9:18-21). Jesus begins to teach his disciples that he will suffer, be killed, and rise to life again after three days. He also teaches them that all followers of Christ must be willing to carry their “cross” and follow him (Matthew 16:21-28; Mark 8:31-9:1; Luke 9:22-27). Upon going down the mountain, Jesus casts a demon out of a boy and heals him (Matthew 17:14-20; Mark 9:14-28; Luke 9:37-42). Returning to Galilee, Jesus once again foretells his death and resurrection (Matthew 17:22-23; Mark 9:30-32; Luke 9:43-45). In Capernaum, Jesus uses the paying of the temple tax to teach that he is the Son of God (Matthew 17:24-27). He also teaches his disciples that childlike faith and a willingness to be a servant to all makes a person the “greatest in the kingdom of heaven” (Matthew 18:1-5; Mark 9:33-37; Luke 9:46-50). He also spends this time teaching about not causing others to sin (Matthew 18:6-11; Mark 9:42-50), rewards in the kingdom of heaven (Mark 9:38-41), confronting sin in fellow believers and leading them toward repentance (Matthew 18:12-35), and the cost of following him (Matthew 8:18-22; Luke 9:57-62). He also confronts the unbelief of his brothers (John 7:2-9). Jesus secretly sets out for Jerusalem to attend the Feast of Tabernacles. He decides to pass through Samaria, but the people of some Samaritan village do not welcome him. When his disciples react angrily, Jesus rebukes them and they travel to another village (Luke 9:51-56; John 7:10). While the Jewish leaders were looking for Jesus at the Festival of Tabernacles, the people whisper and debate about Jesus (John 7:11-13). Halfway through the festival, Jesus appears in the temple courts and teaches the people. While he teaches them about who he is, the Jewish leaders dispute Jesus’ claims. After referring to himself with the divine name of the Lord (“I am” – John 8:58), the unbelieving Jews attempt to stone him but he slips away (John 7:14-8:59). Jesus heals a man born blind and the Pharisees investigate the healing. Jesus teaches the Pharisees that he is the gate and the Good Shepherd (John 9:1-10:21). Jesus sends out 72 people to spread the gospel message in every town and village where he was about to go. They return to him with joy in their successful work (Luke 10:1-24). He also spends this time teaching the Parable of the Good Samaritan (Luke 10:25-37), teaching in Mary and Martha’s house in Bethany (Luke 10:38-42), teaching about prayer (Luke 11:1-13), teaching about asking for a sign (Luke 11:14-36), warning against religious hypocrisy (Luke 11:37-54), and warning against the teaching of the Pharisees, against worry, and about being ready (Luke 12:1-13:9). He also heals a crippled woman and uses it to teach about the Sabbath and about the kingdom of God (Luke 13:10-21). Celebrating the Festival of Dedication in Jerusalem, Jesus once again teaches in the temple courts and confronts the unbelief of his Jewish opponents (John 10:22-39). Jesus returns to Perea and teaches in the region John the Baptist had been baptizing over two and a half years earlier (John 10:40-42). During this time, Jesus teaches the people of this region about entering the kingdom of God (Luke 13:22-30), his impending death in Jerusalem (Luke 13:31-35), compassion and humility (Luke 14:1-14), not rejecting the invitation to eternal life (Luke 14:15-24), willingness to put God above anyone and anything (Luke 14:25-35), compassion for the lost (Luke 15:1-32), focusing on God and God’s Word (Luke 16:1-31), and the importance of forgiveness and a faith-filled attitude of service to God (Luke 17:1-10). Not long before his own death on the cross, Jesus hears that his friend, Lazarus, had died in Bethany. Jesus raises Lazarus from the dead, which creates quite the commotion in Jerusalem and the surrounding areas. Because of this, some of the Pharisees who don’t believe in Jesus make plans to have him killed (John 11:1-54). Hearing of the Pharisees’ plot to kill him, Jesus withdraws with his disciples to a village called Ephraim (John 11:53-54). It seems that from here Jesus traveled northward to meet up with Jewish pilgrims going from Galilee to Jerusalem for the Festival of the Passover. Possibly in the southern part of Galilee bordering Samaria, Jesus joins up with the pilgrims traveling to Jerusalem for the Passover. While traveling, Jesus heals ten lepers, teaches about the Last Day, and also tells two parables to encourage his disciples to pray (Luke 17:11-18:14). Going on from Galilee with the crowd and back through Perea, Jesus teaches the crowds about divorce (Matthew 19:1-12; Mark 10:1-12), the importance of the kingdom of God for little children (Matthew 19:13-15; Mark 10:13-16; Luke 18:15-17), recognizing that one is saved by God’s seemingly impossible grace in Jesus and not by works (Matthew 19:16-30; Mark 10:17-31; Luke 18:18-30), and that this grace is given to all equally (Matthew 20:1-16). Jesus also predicts for a third time his suffering and death coming up in Jerusalem, which shows the disciples the proper attitude of being a servant for others (Matthew 20:17-28; Mark 10:32-45; Luke 18:31-34). Jesus and his disciples travel to Jericho on their way to Jerusalem. While in Jericho, Jesus heals two blind men (Matthew 20:29-34; Mark 10:46-52; Luke 18:35-43), brings a chief tax collector named Zacchaeus to repentance (Luke 19:1-10), and teaches about using the talents God gives you for his kingdom (Luke 19:11-27). From here, Jesus heads to Jerusalem for the final week before his death (Luke 19:28). Jesus arrives in Jerusalem for the last week of his earthly ministry, called Holy Week. See separate timeline called The Events of Holy Week for a detailed presentation of what happens on each day (click this dot). Three days after being crucified for the sins of the world, Jesus rises from the dead. On that Sunday, he appears to a number of people. (See separate timeline called Order of Resurrection Events for more detail on what happened that first Easter morning (click this dot)). A week later, Jesus appears to his disciples again, this time including Thomas (John 20:26-31). Jesus later appears to seven of his disciples at the Sea of Galilee (John 21:1-25). He also later meets eleven of his disciples on a mountain in Galilee and gives them the Great Commission (Matthew 28:16-20; Mark 16:15-18). Jesus appears to his brother James (1 Corinthians 15:7) and again to his disciples in Jerusalem (Luke 24:44-49; Acts 1:3-8). Ten days before the event on Pentecost (Acts 2:1-41), Jesus leads his disciples to the vicinity of Bethany. There he blesses them and then ascends into heaven (Mark 16:19-20; Luke 24:50-53; Acts 1:9-12). Somewhere between 3 and 8 years later (in 32 AD), Jesus appears to a Christian persecutor named Saul on the road to Damascus (Acts 9:1-19; 22:3-16; 26:9-18). Saul is converted (and later called Paul), receives the gospel by revelation from Christ, and seems to study the gospel for three years (Acts 9:20-31; Galatians 1:11-24). He becomes the apostle to the Gentiles (non-Jews). Baumler, Gary P. John. The People’s Bible. Milwaukee, WI: Northwestern Publishing House, 1997. 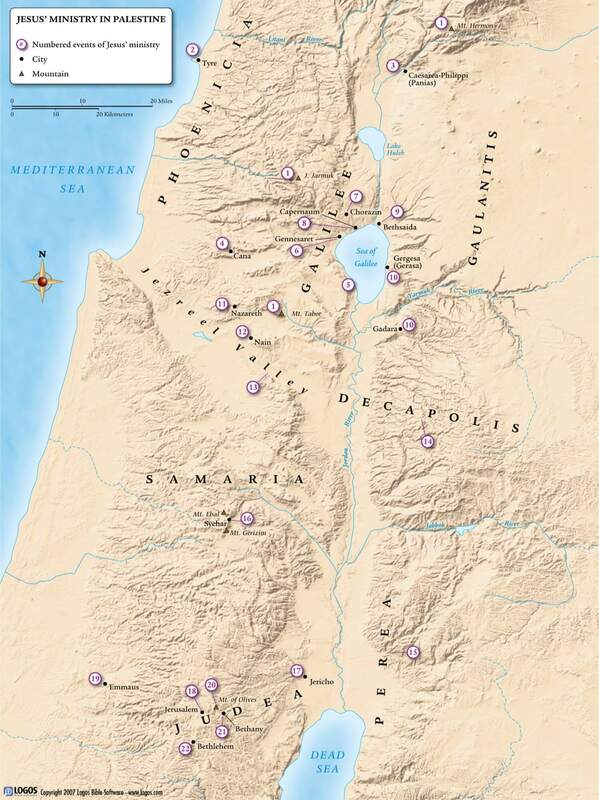 Bible Atlas.org: Bible Maps for every OT and NT Location. Accessed 2017. http://bibleatlas.org/. Burton, Ernest DeWitt. A Harmony of the Synoptic Gospels for Historical and Critical Study. New York; Chicago; Boston: Charles Scribner’s Sons, 1917. Cox, Steven L., and Kendell H. Easley. Holman Christian Standard Bible: Harmony of the Gospels. Nashville, TN: Holman Bible Publishers, 2007. Hendriksen, William, and Simon J. Kistemaker. Exposition of the Gospel According to Luke. Vol. 11. New Testament Commentary. Grand Rapids: Baker Book House, 1953–2001. Hendriksen, William, and Simon J. Kistemaker. Exposition of the Gospel According to Mark. Vol. 10. New Testament Commentary. Grand Rapids: Baker Book House, 1953–2001. Hendriksen, William, and Simon J. Kistemaker. Exposition of the Gospel According to Matthew. Vol. 9. New Testament Commentary. Grand Rapids: Baker Book House, 1953–2001. Robertson, A. T. A Harmony of the Gospels. Bellingham, WA: Logos Bible Software, 2009.